Brand new repress with all new artwork by Sara Deck. This is not a dream. Death Waltz Recording Company are proud to be returning another classic work to corporeal existence in the form of John Carpenter and Alan Howarth’s score to PRINCE OF DARKNESS. The second in Carpenter’s “apocalypse trilogy” (sandwiched in between THE THING and IN THE MOUTH OF MADNESS) the film takes on the myth of the return of the Anti-Christ to the living world but ingeniously places it into the world of science, dealing with notions of matter, antimatter, and theoretical physics. As is usual with Carpenter’s films, it was not treated well on release but has since picked up a cult following from home video. 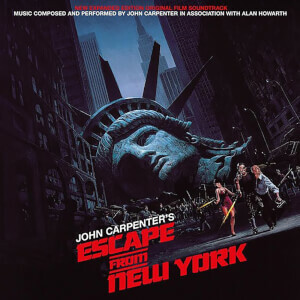 Carpenter and Howarth’s score has the feel of a dream and a nightmare, one which is immediately displayed in the main title theme, where ethereal voices are combined with a typically catchy bassline to create a sense of disquieting mystery. Wild and dissonant synthesizer effects are juxtaposed with more traditional melody which suggests the meeting of our world and that of the Anti-God. The best way to stop the end of the world happening again is to listen to PRINCE OF DARKNESS.